Will the massively-inconvenient Metro "safety project" scheduled to begin this weekend actually produce results? That is hardly clear. What is clear, is that the inconvenience is in part designed for a goal beyond safety - softening up you, the taxpayer, for a major tax increase. 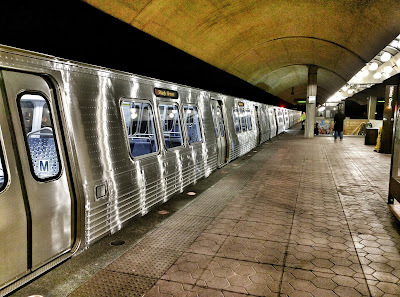 We've already dealt with one "urgent" Metro crusade to fix long-delayed mechanical and safety issues throughout the system, leaving many weekend riders standing for hours in stations or taking shuttle buses instead. The results of that were zero, squat, zilch, as the current safety crisis proves. But the big talk we've been hearing about the need for extreme measures like shutting down whole lines for months just happens to be coming from some of the biggest proponents of new taxes to fund Metro, including D.C. Councilman Jack Evans and Montgomery County Councilmember Roger Berliner. Funding increased Metro capacity - expanding to 8-car trains, in particular, and increasing capacity on the Red Line north of Grosvenor - was something many transportation advocates have supported. The idea of simply pouring a whole lot of additional money into the bastion of incompetency known as WMATA, however, is a completely different prospect. It is very similar, coincidentally, to the Montgomery County Council's irresponsible decision to massively raise taxes on residents, and bust the bank by going $90 million over the required funding level for Montgomery County Public Schools - without a dramatically-different strategy to tackle the achievement gap than the failed one being utilized now by MCPS. Money down a toilet, in other words. It's no surprise, then, that some of the loudest voices calling for a massive new tax for Metro are on the Council. “We hope to have a plan ready to present by the end of September,” Councilmember Roger Berliner told The Washington Post. “Between now and then, we’re going to work with our jurisdictions to see if we can come up with unanimity with respect to a mechanism — a sales tax, a gas tax." WMATA has shown zero results, and zero evidence to prove it is changing its ways. The agency is probably in need of a federal takeover, but even the feds don't want to touch this mess. You'll also note that, once again, no proposal under consideration involves taxing developers, just the residents. While many local leaders and media types are almost giddy about the pain you are going to feel using public transit starting this weekend, I have a more sobering prediction. This really, really bad PR campaign designed to make you believe we really need to pour more money into the coffers of an entity ranking somewhere between Barwood Cab and the County liquor monopoly in terms of public popularity, is actually going to deal already-declining Metro a mortal blow. A grand strategy to get more cash is actually going to end up costing WMATA cash. Because, starting this weekend, folks are going to be getting into their cars, not out of them. They're going to be buying cheap used cars. To a lesser extent, they're going to be biking or using Zipcar or Uber (don't tell the County Council). And many, many months from now, they're going to consider the calls for new taxes for a Metro slush fund. And they're going to consider the latest fare increases being proposed for the same service that ain't worth it at half the price. And you know what they're going to say?